The Institute of Strategic Studies Islamabad (ISSI) hosted an In-House Meeting on August 9, 2018, with H.E. Mr. Yao Jing, Ambassador, Peoples Republic of China in Islamabad. The topic of discussion was “Pakistan-China Relations and the Evolving Global and Regional Situation”. Eminent diplomats and academic experts also attended the meeting which included Mr. Inam ul Haque, former Foreign Minister, Dr. Rifaat Hussain, Professor, National University of Science & Technology (NUST), Mr. Khalid Rehman, Executive Director, Institute of Policy Studies (IPS), Ambassador Shahid Kiani, Ambassador (R) Fauzia Nasreen, Head, Centre for Policy Studies (CPS), COMSATS, Maj. Gen. (R) Khalid Amer Jafaery, President, Centre for Global and Strategic Studies (CGSS), Ambassador (R) Rizwan Ul Haq Mahmood, Ambassador Abrar Hussain, Mr. Imtaiz Ahmad, Additional Secretary (AP), Ministry of Foreign Affairs, Miss Maryam Rehman, Director (CPEC), Ministry of Foreign Affairs, and Dr. Shahid Rashid, Executive Director, CPEC, Centre of Excellence, Pakistan Institute of Development Economics (CEPIDE). 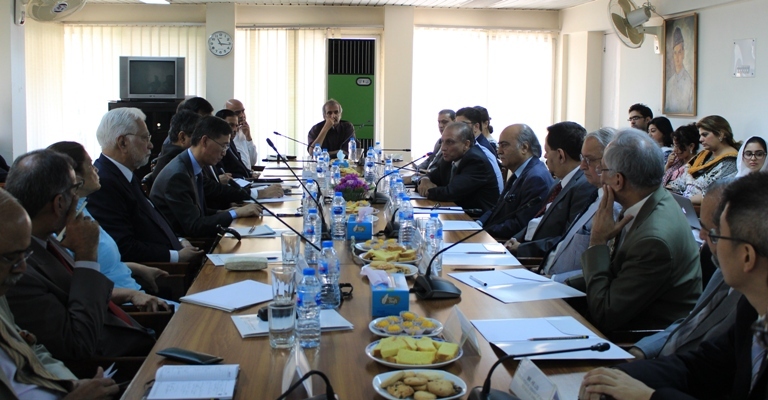 The Ambassador and participants of the meeting discussed various aspects of bilateral relations between Pakistan and China including economic, security and political cooperation between both the countries.